This 14 year old boy sought dental treatment because of a moderately large bulge in the mandibular mucobuccal fold. 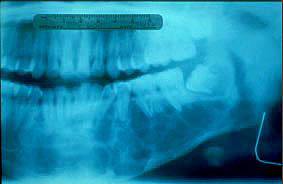 A panoramic radiograph shows a large multilocular radiolucent lesion extending from the lower left second molar to the lower right cuspid area. These are the two most likely choices due to the size of the tumor and the presence of variously sized locules. Slide 1 (medium power, H&E). 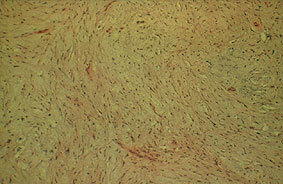 This field shows a moderately cellular lesion with a lightly staining myxoid background. 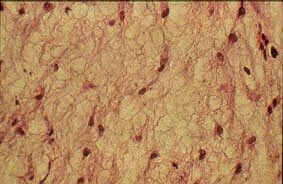 The cells appear slender and contain deeply staining nuclei. Slide 2 (high power, H&E). 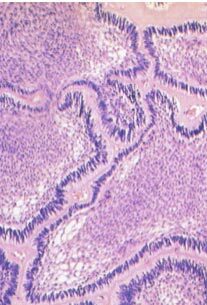 The cells contain deeply basophilic ovoid nuclei and exhibit slender elongated cytoplasmic extensions.